Winnipeg pop artist Robert Pasternak has taken the psychedelic poster art of the 60's and 70's and elevated it into a personal art form. His surrealistic work has been popular with fans of science fiction and fantasy books, and he has been invited to show his paintings and illustrations and science fiction conventions. Although his colours zap your eyeballs, you won't need to bring along a black-light lamp to fully appreciate his latest exhibition - at the Piano Nobile Gallery in the Centennial Concert Hall. The 13 acrylic-on -canvas paintings, dated from the early '80s to this year, show the development of Pasternak's style in an engaging and thoughtful presentation by curator Arnold Ross. The paintings reveal the artist's fascination with space, dimension and energy, all expressed in arresting colour schemes, power wave lines and overlapping images. There seems to be a kind of magical, mystical philosophy inspiring Pasternak's works, and a preoccupation with themes that express the supernatural power of the mind. Jen Flow(1994) is a recent example of this. The central image of a blond girl is enveloped in an hour-glass of waves emanating from her body. Above her is blue sky, and below, the sun. The cavernous brown areas on either side of her suggest that the figure is undergoing a metamorphosis, or rebirth of some kind. Pasternak's art tends to tire out the viewer with it's barrage of high-concept, overly dramatized swirls of fantasia. If nothing else, it makes one appreciate, by default, the intrinsic value of subtlety in art. But Pasternak seems to have come a long way in his artistic journey from the adolescent appeal of his earlier works, such as Hi (1983), which features a little green demon nestled in a man's hand, with its tail wrapped around the fingers. One of the most impressive works, perhaps for ots relative simplicity, is Too Much (1989). 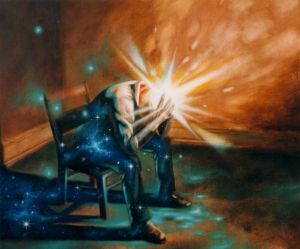 In this painting, an old man in denim overalls sits on a wood chair in an empty room, holding his head with his hands. As he struggles with some inner conflict, a white-hot flash of light surrounds his head with a starburst halo. Here Pasternak shows his command of the realistic and the fantastic, usung earthen colours and soft contours to set up a stunning contrast to the jagged brightness of the light. Another way he blends the two worlds into one are the shadows in the picture; instead of ordinary blackness, they have the blue-blackness of a night sky peppered with stars. The Tenth Sense (1996) summons the image of a woman asleep in her bed, with her mind vivisected for us to reveal a pair of hands reaching upwards into a clouded blue sky. Interrestingly, the goldness of her skin, and the almost metallic gleam of the satin sheets, make the woman seem more fantasy-like than her exposed dream of open skies. That's because Pasternak's other worlds are real enough to the artist. One of his space landscapes, Saturn Conscious(1994), features the planet Saturn drifting in a universe stratified into layers of rich burgundy abd greens, divided by a jagged blue line like a reading from a seismic device or a brain-wave monitor. Of course paintings like Saturn Conscious have strong spiritual connotations, but these other worlds are forbidding enough that only the daring or the drugged would want to explore them more deeply.